Lok Satta News: బంద్ లను విమర్శిస్తే, తెలంగాణాకు వ్యతిరేకమని ప్రచారమా? బంద్ లను విమర్శిస్తే, తెలంగాణాకు వ్యతిరేకమని ప్రచారమా? So you agree that JP had colluded with TRS? Why is he not using the right then? whom JP is saving? Google is planning to setup their branch in Warangal, the heart of Telangana vaadam. What JP has to say on this? 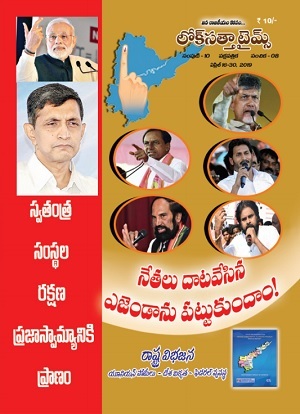 Being a political party head, he must either openly support or oppose Telangana. If he thinks, cause of Telangana is justified, why can't he come out and work for that? What does it mean, only when there is an incident by Telangana people, he comes out and gives his lectures freely and keeps mum when the similar incidents are done others? Being a political party head, he must either openly support or oppose Telangana. A political party does not always need to either support or oppose on any issue. They can chose to be neutral, if that issue does not solve the problem. 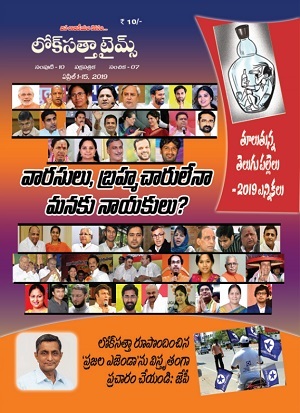 JP is a double standard person,he talks for his convincing,no one has doubt over his ethics and sincerity but he should support Telangana state where he is exposed his actual personality and he should get elected from RayalaSeem oe Andhra and solve their problems and he should not base in Hyderabad.